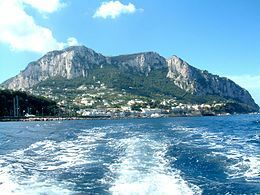 Capri, known in Greek mythology as the isle of the sirens, was a favored resort of the Roman emperors. Most notoriously, the emperor Tiberius had his villa on the island, the location (supposedly) of debauched orgies. Those who displeased the emperor were flung to their deaths from the cliffs. This article uses material from the Wikipedia article "Capri", which is released under the Creative Commons Attribution-Share-Alike 3.0 License.